Wednesdays are my crazy days! Dave is at school, so I try to cram in as baking, cleaning, and errand running into 4 hours as I can. Tonight I decided to try a new savory muffin recipe on top of baking bread, cleaning the bedroom, doing the laundry, dishes, and some brief shopping. I've been making a lot of muffins lately because we don't usually take time for breakfast before we head out in the morning. These are different than anything I've made before, really tasty and with the oats and wheat flour can't be that bad for you! Preheat the oven to 400 degrees. Grease a 12 - 18 cup muffin tin, or line with paper liners (fill to the top, they don't rise much). In a large bowl, stir together the flour, oats, baking powder, baking soda, salt, garlic powder, and onion powder. In a separate bowl, mix together the melted margarine, egg and buttermilk. Add the wet ingredients to the dry, and mix until just blended. Fold in the crumbled patties and cheese. Spoon into the prepared muffin cups. Bake for 8 to 12 minutes in the preheated oven, or until the top springs back when lightly touched. Cool in muffin tins on a wire rack. So this morning was one of those “Oh crap!” car moments for me, followed by a learning experience. My car has been shaking a little on the freeway lately, and I’ve been watching it with concern. Well this morning when I drove through the freeway construction that takes me to my work I hit some bumps in the road. I’m not talking about little cement to asphalt transitions, but big divots that we have no choice but to drive over. And it’s on the freeway, which means I’m going 65. So I hit these bumps and my car starts violently shaking! So much so that I think I figure I must pull over to see what I’ve hit/what’s wrong. Oh. My fault. Um… Really, the Fix-A-Flat? For those of you not familiar with the product, it’s to fix slow leaks, or be a temp fix for bigger leaks. It’s a bottle of goo that you pump in your tire and you should be good. I don’t know why this is a problem now, when I haven’t used the Fix-A-Flat since I had a slow leak in September, but maybe it’s because there haven’t been such insane bumps on the road as construction this morning presented. No matter what the case may be, problem solved. Lesson learned. I feel dumb… Learn from my mistake and don’t use Fix-A-Flat! Dave had a killer home work weekend! Friday he was doing homework from 8am to 6:45pm, Saturday from 8:00am to 7:45pm, and Sunday night he had to do some touch-ups on a project (even though he tries his best not to do home work on Sundays). But don’t worry, we did take a two hour break Sunday to drive to my parents house to celebrate Dave’s 29th birthday! Although his birthday isn’t until the 18th, we do Brown family birthdays the first Sunday of every month. So there was a little relaxing this weekend, even if it was brief. In a small bowl, whisk together the milk and egg. Preheat oven to 400 Degrees. Heat remaining 1/4 c. oil in a large non stick skillet over medium heat. Dip the fish in the egg mixture. Place the fish in the skillet and cook for 3 to 5 minutes, or until golden brown. Place in a non stick baking dish, and bake for 5 minutes. Wipe the skillet clean. Add the almond mixture to the skillet while the fish is in the oven and cooking. Stir frequently for 5 minutes. To serve place the fish on a serving platter and spoon the almond mixture over the fish. Serve with rice or potatoes. The topping on this was to DIE for (yes Mom, mushrooms can taste good)! This recipe didn't cover the fish tase as much as my first try, but it still wasn't overwhelming. If you're a fish lover you will LOVE this (Dave did), if you're a fish hater, this isn't so bad! I have several projects that I call my Epoch Projects because they are incorporated in life altering experiences. They help define myself. They take immense amounts of time to complete. Some of these projects include typing up all my journals (especially the mission one), highlighting my scriptures in a unique color coded method that only I know the secret to, and collecting/organizing and storing a year supply of food. This week I completed one of these epoch projects! And there was much (personal) rejoicing. As all good Brown women I love to cook! When the Brown family gets together we share our delectable delicatessens. I’ve been working on compiling all my recipes since I got home from my mission in 2006. We’re not just talking about putting them in one place; they’re always in a big stack in the kitchen. I mean typing them all up, organizing them into sections, and placing them in binders divided as I see fit. 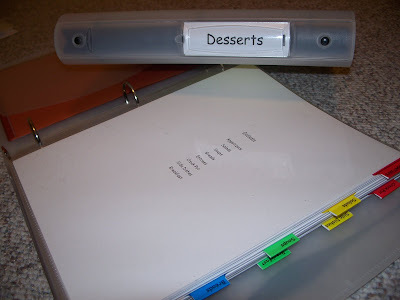 Right before I moved to Salt Lake 2 years ago I got a big chunk of my mom’s recipes typed up organized and filed, which left me with a binder full of the beginning of my project. But since then I have added more to my stack than I have been typing, organizing and filing. Late Monday night as Dave was finishing his Homework I typed up my last recipe! Tuesday night I printed out my last 20 recipes, organized them, and added the last of my labels. Here’s what the final project looks like. You’ll notice I have two binders worth of recipes. 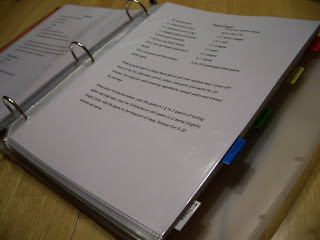 This is because I have WAY too many dessert recipes, so they occupy their own binder, where real food is in the second. Here’s a peak of the breakdown (note they’re all in water resistant plastic sleeves so you can spill on the book without dire results. Very convenient!